FOREX TRADING GUIDE: WHAT IS TWEEZER CANDLESTICK PATTERN, AND HOW TO TRADE IT ? WHAT IS TWEEZER CANDLESTICK PATTERN, AND HOW TO TRADE IT ? yourFXguide-Tweezer candlestick pattern was introduced by Steve Nison, who worked to popularize Japanese candlesticks in west, in his book "Japanese Candlestick Charting Techniques. "Japanese candlestick charting is the best among the all charting techniques to present changes in price. 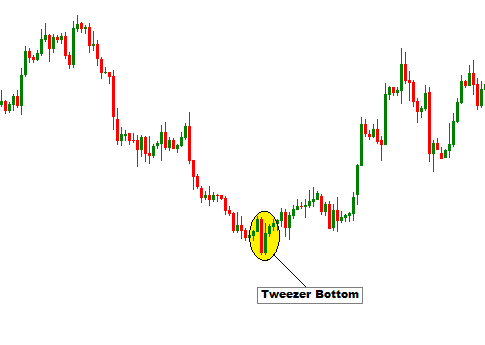 In this post I am going to introduce tweezer candlesticks pattern that can be considered as a reliable signal of trend reversal or continuation. First of all we need to learn "How do tweezer candle stick patterns look like ?" In general, a tweezer candlestick pattern is composed of two consecutive candlesticks, and when they are at the top of a trend, they have the highs at almost exactly the same level, and when they are at the bottom they have lows at exactly the same level. A tweezer top is composed of two consecutive candlesticks, that have the highs at almost same level. Similarly, a tweezer bottom composed of two consecutive candlesticks, that have the lows at almost same level. Remarkable,a tweezer top follows a bullish trend and a tweezer bottom follows a bearish trend. The highs of the two consecutive candles should be at almost same level. The color of the candles are not important. The first candle should be formed with relatively large body, that is formed by opening and closing price. The size of the second candle is not considerable. A tweezer top should follow a bullish trend. The lows of the two consecutive candles should be at almost same level. A tweezer bottom should follow a bearish trend. 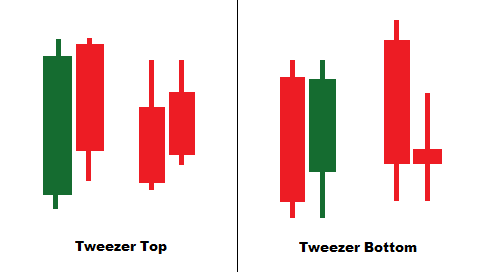 Successful identification of tweezer candlesticks pattern is very important before you place an order. If the highs or lows of two consecutive candles are exactly at same level, the tweezer candlestick pattern is more reliable. If a tweezer candlestick pattern also represents any other candlestick patterns, formed with two candlesticks, the tweezer pattern is considered as more accurate. 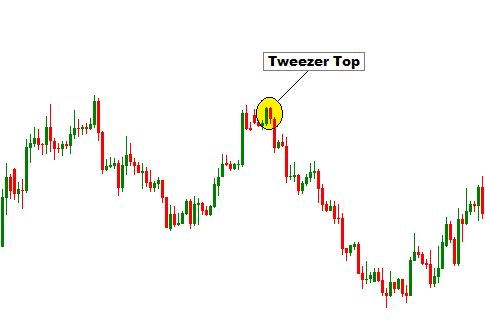 Generally, when a tweezer top is identified at the top of a bullish trend, a short entry is suggested when the price closes below the closing price of second candle. Similarly, when a tweezer bottom is identified at the bottom of a bearish trend, a long entry is suggested when the price closes above the closing price of second candle. Tweezer candlesticks patterns can be more accurately traded, if they are traded at support or resistance levels. The support and resistance levels can be identified with any of the popular tools such as pivot point analysis, fibonacci retracement levels, trend lines etc.